The third in a 5-part series, reviews the science behind drug abuse and addiction and introduces the topics of prevention and treatment. The fifth in a 5-part series, summarizes the science behind drug abuse and addiction, reviews the harmful consequences of drug use, and poses the question of whether it is worth the risk. 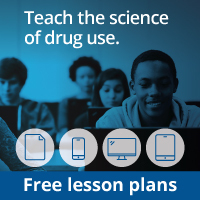 The first in a 5-part series, offers an understanding of the brain, how the reward center works, and what happens in the brain when a person uses cocaine, opioids (heroin), or marijuana.